Bus rides and chaperones and head counts, oh my! There’s nothing quite like taking your lessons out of the classroom and into the great, wide world with school field trips. Although field trips can be a fun break from the usual routine, they come with their own set of challenges that can make any teacher feel as if they are reenacting The Wizard of Oz. A full day out in the wild with 30-something students and a handful of parents? No, thank you. Call us cowardly, but a lot of teachers would rather take this time to get caught up on grading or lesson planning. You’ve taught these kids all year and, truly, you love them. But without the regular bell schedule or even recess to break up the day, you have no idea how they’ll react to a two- or three-hour bus ride. You tread carefully, hoping to finish at least one chapter of your novel without interruption. Whether it’s “99 Bottles of Beer on the Wall” or the latest Justin Bieber hit, it’s hard to keep calm for 15 minutes, much less a couple of hours. If your students aren’t singing a cappella, odds are they’re blasting music from their phones and singing along to songs that you thought were way too mature for your kiddos. Are we there yet? You’ll breathe a sigh of relief as you approach your destination—whether that be a museum, gallery, aquarium, or other educational institution. The journey is half the battle, but your story isn’t over yet. Where are the assigned seats? Your color-coded filing system? Heck, where is the bathroom? Like a fish out of water, a teacher out of their classroom can feel just as disoriented as Dorothy upon her arrival to Oz. Where’s Glinda when we need her? Even the best of us get hangry. Can’t you just sneak a quick snack? The answer is usually no and, after all, you’ve got to set a good example for your students, don’t you? Admit it, you need a little help here, don’t you? 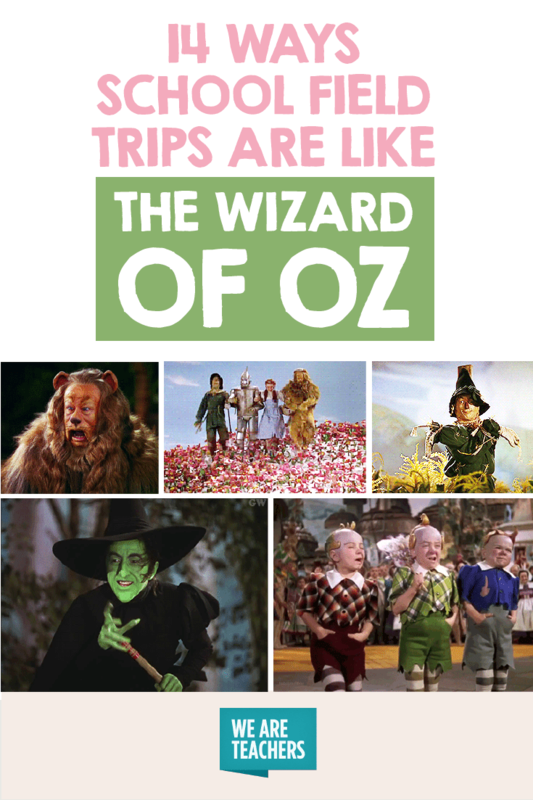 Luckily you had the foresight to schedule a tour with an experienced guide—your Glinda the Good Witch—who will take the reins for a while. With her in charge, you just need to keep count of your little munchkins. You’ve discussed this trip in class for weeks and did your best to prepare your students to engage in intelligent conversations with the staff at your field trip destination. While you may not address your students with Dorothy’s sass, you cross your fingers and hope they act maturely. The kids are having fun and—admit it—you’re having fun. But someone has to enforce the rules, don’t they? You can’t help but feel a little bit wicked laying the hammer down on field trip day. There’s a fine line between a field trip and a free-for-all, and notetaking is one surefire way to keep the former from becoming the latter. A good teacher knows their students will get the most out of a trip when they are active participants. After all, field trips are great fodder for extra credit questions, right? Whether you’re dining in a museum cafeteria, picnicking outside, or grabbing a bite at a restaurant, you’ll be ready for your second wind come lunch time. “Let’s meet back here in an hour” are the most liberating seven words a teacher can hear while chaperoning a field trip. Miraculously, everyone has made it through the trip in one piece, and all that’s left to do is get everyone back on that bus and take the final head count. It’s all you can do to keep from skipping with joy, knowing the trip has been pulled off without a hitch. Even the most sensible footwear can leave your feet aching at the end of a field trip—even more so than being on your feet in the classroom. Teachers everywhere can relate to the sense of relief that comes with calling it a day and settling back down for the bus ride home. Do you have field trip tips? Come and share in our WeAreTeachers HELPLINE group on Facebook. Plus, field trip mistakes to avoid. Julia is a writer and teacher living in Nevers, France. She received degrees in English and French language and literature from the University of Virginia and is constantly on the hunt for her next story. When she's not writing you can find her supplementing her wine and cheese diet with long runs and the occasional dance party.